If you’re a sports fan planning a holiday to New York, here are five must-see venues to check out during your visit. New York City is a high energy city with lots to see and do, so it’s no surprise that it features on many travel wishlists. Whether it’s the fantastic food, the shows on Broadway, the shopping on Fifth Avenue or the open space of Central Park, there’s so much to choose from. But what about the sporting experiences in NYC? New York is home to many world class sporting venues and sports teams, so it’s the perfect place for any sports fan to visit. If you’re planning a New York holiday, this handy tool from Travel Planners to guide you around some of the places to visit while you’re there. And to help you choose, I’ve picked out some of my favourite New York sporting venues. Which one is your favourite? Manhattan is home to Madison Square Garden, one of the world’s iconic venues. In fact it’s own tagline is ‘The World’s Most Famous Arena’. Also known as The Garden, it’s situated above Pennsylvania Station in Midtown Manhattan. 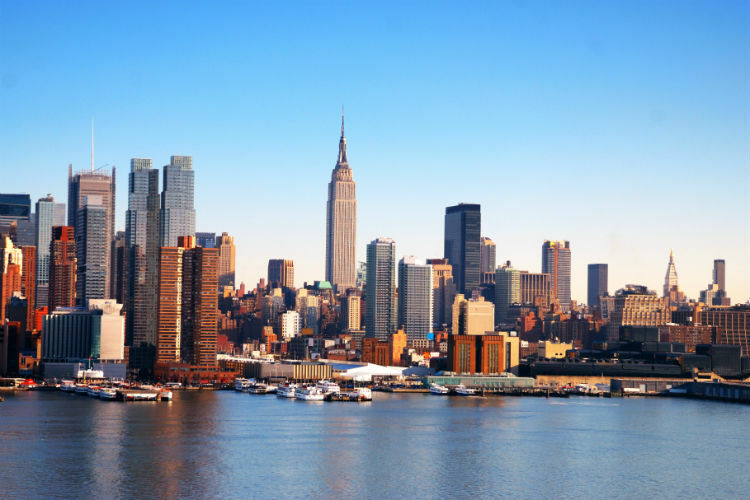 It is close to other well known New York landmarks, such as the Empire State Building and Macy’s. Madison Square Garden is a popular venue for ice hockey and basketball matches, as well as many other sports. It also hosts ice shows, circuses and concerts. In the past it has also seen famous boxing matches including the ‘Match of the Century’ between Muhammad Ali and Joe Frazier. Around 350 events take place at The Garden each year, so there’s a good chance that you’ll find something to interest you during your New York holiday. But many of the events sell out, so it’s a good idea to check ahead as soon as you know your travel dates. Head over the Brooklyn Bridge into Brooklyn, and you’ll find the Barclays Center. This is a fairly new venue, which opened in 2012 in the area called Pacific Park. It’s easy to get to, as the centre is above the Long Island Rail Road Atlantic terminal, and the Atlantic Avenue subway station is right next door. If you love basketball or ice hockey, the Barclays Center is a must-see during your visit to New York. The venue is home to both the Brooklyn Nets basketball team and the New York Islanders ice hockey team. The centre is also used for concerts, with many big names having performed there including Beyoncé, Rihanna and the Rolling Stones. If you love baseball, you definitely need to head to the Bronx during your holiday in New York. There you’ll find the famous Yankee stadium, home of the New York Yankees. This stadium was built in 2009, replacing the original Yankee Stadium. It’s an impressive building, which you can look around on an organised tour. You can easily get to the stadium by subway. The regular baseball season usually runs from late March through to late September or early October. It is followed by the post season which can run to early November. So there’s plenty of opportunity to fit in a game while you’re visiting New York! Baseball fans will also want to head to Staten Island during a visit to New York. The Richmond County Bank Ballpark at St. George is located on the north-eastern tip of Staten Island. Getting to the Richmond County Bank Ballpark means taking the subway followed by a 25 minute ride on the famous Staten Island ferry. The ballpark is home to the Staten Island Yankees, the NY-Penn League affiliate of the New York Yankees. This has led to it being more commonly known as the Staten Island Yankees Stadium. And the venue also hosts the Wagner College Seahawks baseball team, and local high schools have the chance to play at least one game there as well. And last but not least, my personal favourite on this list! Tennis fans should definitely take a trip out to Flushing Meadow in Queens when visiting New York. There you’ll find the USTA Billie Jean King National Tennis Center, which plays home to the US Open each year. It’s easy to get to by simply taking the #7 Flushing line out from Manhattan. The centre is used to train tennis players all year round, but you can take a tour of the facilities between October and July. And if you’re visiting New York in the summer, you may be able to catch some of the action at the last Grand Slam of the year. The US Open takes place over two weeks in late August and early September, and features the top players in the world. A holiday to New York is perfect for any sports fan – which venue would you like to visit?